The Sony VPL-VW870ES pictured from above. Side view of the Sony VPL-VW870ES. Angle view of the Sony VW870ES 4K projector. Lens detail of the Sony VW870ES. Rear view of the Sony VW870ES. 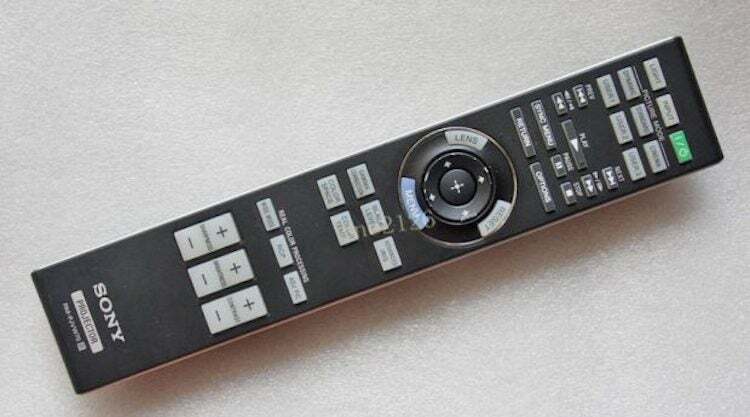 The remote for the Sony VW870ES. 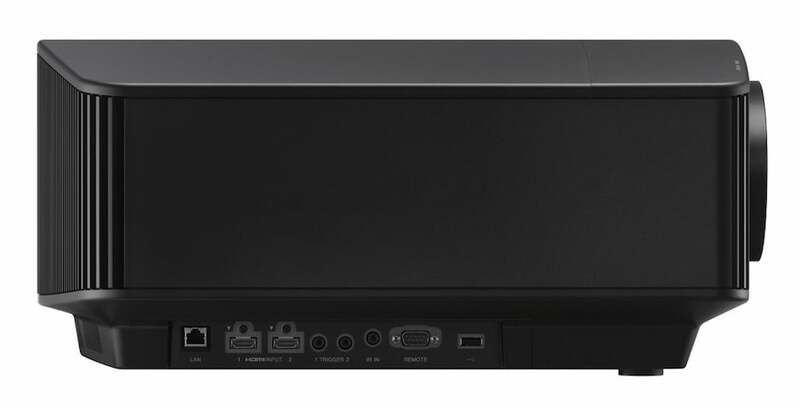 What is the Sony VPL-VW870ES? The Sony VPL-VW870ES is a home cinema projector that combines a true 4K resolution with laser-based lighting. It’s out to deliver a premium big-screen experience, complete with enough brightness to make HDR pictures look much more convincing than they usually do on projectors. While the VW870ES is immediately recognisable as a Sony projector, looks-wise it isn’t identical to the previously reviewed VW570ES and VW270ES in the range. For a start, at 223 x 560 x 496mm, it’s quite a big unit. This lets it accommodate both a laser – rather than lamp-based – lighting array, and an enhanced venting system for shifting the extra heat generated by the laser. 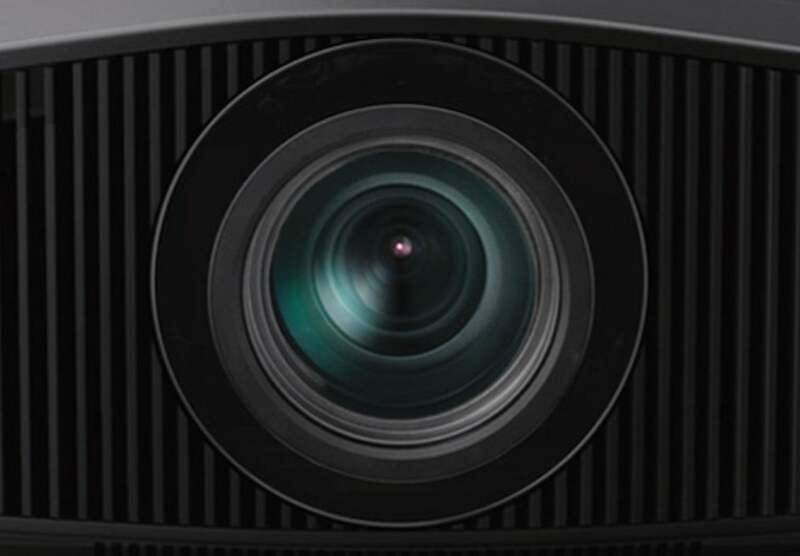 Its lens also protrudes from the projector’s front rather than being recessed as it is on Sony’s cheaper 4K models. As a result, you don’t get the silver detailing around the lens the latter models carry. The typical Sony elliptical shape with the curved upper edge is still present, however. As is the grilling around the projector’s edges to help it disperse heat. Here, though, that grilling runs right up to the lens rather than stopping a few inches short as happens with the VW570ES and VW270ES. The projector is heavy (22kg) and exceptionally robust, hinting at uncompromising build quality and components. The VW870ES ships with an excellent remote control. It’s big enough to easily find in a dark room and carries large, widely spread and well-organised buttons. These buttons are brightly back-lit, too. The most immediate thing that most people will notice about the Sony VW870ES is its price. A pound under £25K puts it way beyond the average home cinema punter’s budget. So we need to get to the bottom of why Sony thinks it’s worth so much. The most important feature is its laser diode lighting system. This can deliver 2200 lumens of brightness and a potentially wider colour range than normal lamp technology. This makes it better placed than most projectors to make high dynamic range (HDR) look good. The VW570ES, by comparison, delivers only 1800 lumens of peak brightness. Although as noted in our review of that model, there’s a surprising amount of impact from those 1800 lumens. Hopefully, the VW870ES will similarly maximise its brightness potential. The VW870ES also claims a 20,000 lifespan for its Z-Phosphor laser, which is far longer than you’d get from a traditional projector lamp. Although, once the laser is done, that’s pretty much the end of the projector’s life. It isn’t possible to simply replace a laser diode as you would a lamp. The Sony VW870ES sports a significantly higher quality lens than you get in its £8000, step-down VW570ES. Described as an All-Range Crisp Focus (ARC-F) lens, it’s a large-aperture affair featuring an all-glass design for all of its 18 elements. This should enable the projector to deliver even more crispness and detail from its native 4K SXRD imaging chips. The 18 sections also include six extra-low dispersion sections designed to ensure that more of the projector’s light ends up where it should: on your screen. Also exclusive to the VW870ES is a Digital Focus Optimizer, which compensates for possible optical degradation in the lens to further boost its 4K charms. Perhaps the single most exciting feature of the VW870ES is its unique Dual Contrast control engine. This operates dynamic laser and advanced iris controls in tandem to combat laser technology’s typical difficulties with black levels. One other sign of the VW870ES’s premium nature are the options to switch out the standard lens for a short-throw option if room space is limited; or add an anamorphic lens attachment for 4K sources. Alongside all this high-end tech are a wealth of features shared with the VW570ES. For instance, there’s compatibility with the HLG broadcast-friendly HDR format as well as the industry standard HDR10 system. There’s no support for the Dolby Vision or HDR10+ “dynamic” HDR systems – but these don’t appear on any other projector, either. Sony’s Reality Creation processing is provided to boost the picture’s sharpness without ramping up noise. This is especially useful when it comes to upscaling sub-4K content to the projector’s native 4096 x 2160 resolution. Sony’s Triluminos processing optimises the colour range delivered by the laser/SXRD engine, while the HDMIs the VW870ES carries support 10-bit 4K HDR at up to 60fps. 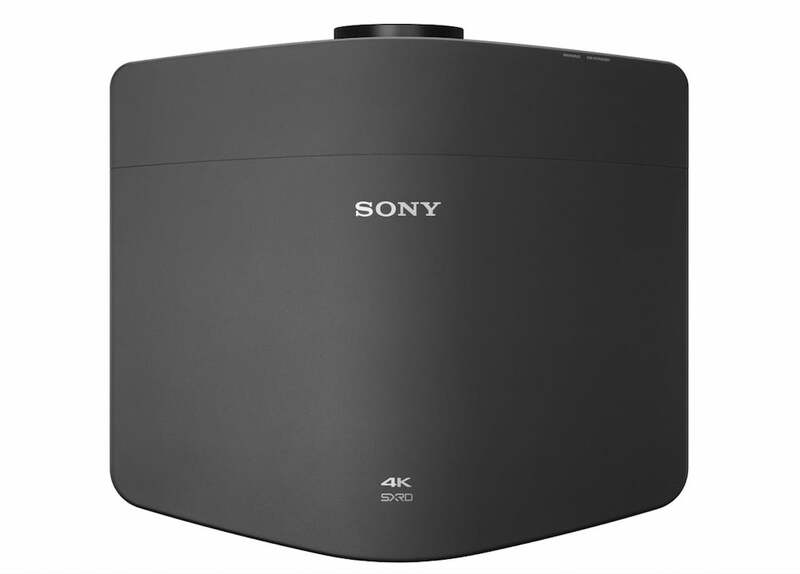 Previous Sony 4K projectors have been limited to handling 4K HDR at 30fps. Further processing comes in the form of Sony’s MotionFlow system for tackling judder. Plus, there are picture position memories so that you can adjust the image for different aspect ratios at the press of a single button, and a low input lag mode to enhance gaming performance. Activating this finds the projector taking around 30ms to render pictures. This is a very respectable result for a high-end projector. Finally, connections on the Sony VW870ES include two HDMIs, a LAN port, two 12V triggers, an IR input, and a RS232 port. Related: What is 4K TV and Ultra HD? If you buy the VW870ES, I’d strongly recommend that you have the device professionally calibrated. This will help counter against the slightly green tinge that’s present in the VW870ES’s out-of-the-box state. Failing that, though, start by running the auto-calibration feature, since this at least reduces the green influence. I’d suggest you pick either the Cinema 1 or Cinema 2 picture presets. Cinema 1 offers more brightness (and therefore impact with HDR), but causes slightly more fan noise and shallower black levels. Cinema 2 improves black levels and reduces fan noise, but sacrifices quite a bit of the brightness that’s arguably the VW870ES’s main attraction. Bearing this in mind, I think Cinema 2 will probably satisfy a greater number of people overall than Cinema 1 – at least in terms of HDR. Cinema 1 feels better tuned for standard dynamic range sources, though. The Sony VW870ES provides a long list of motion settings. However, the True Cinema or Combination options are the only ones neutral enough to be really effective. The laser light output control provides an impressive degree of choice when it comes to balancing HDR-friendly brightness against black level. Finally, you’ll definitely need to familiarise yourself with the VW870ES’s Contrast HDR setting. Essentially this lets you sacrifice detail in peak brightness areas of HDR pictures for a narrower, but more generally brighter, light range. You need to set this to around 40 to remove all detail “clipping” from the brightest HDR picture areas – but, at this point, the picture overall tends to look quite dark. I’d say you can set it as high as around 67 before clipping becomes really quite drastic – at which point the average brightness of HDR pictures is far more satisfying. Getting the VW870ES’s pictures into the right place on your screen is exceptionally easy. Not least because you can adjust the lens’s zoom, focus and horizontal/vertical optical shift via the remote control. The responses to your adjustments are precise, and offer more than enough flexibility to adapt the projector to almost any room size or layout. 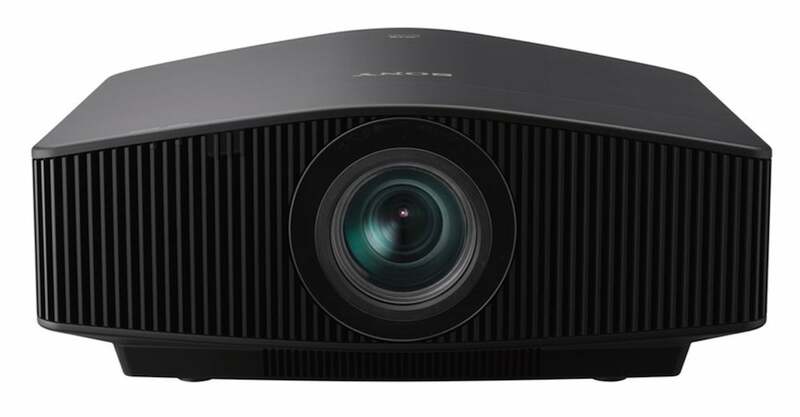 No projector costing under £50,000, nevermind £25,000, has delivered as much raw punch with HDR as the Sony VW870ES. As hoped for based on our experience of the VW570ES, Sony’s laser model makes its claimed 2200 lumens of laser-delivered brightness look conservative. Especially with some judicious management of the Contrast HDR setting. As a result, HDR images really pop off your screen, and deliver a serious step up over SDR. The Sony VW870ES’s HDR prowess even helps it look the part with HDR 4K Blu-rays that have been mastered to 4000-nit peaks, rather than the more common, less demanding 1000 nits. These sorts of HDR skills are a big deal in a projection world, where a lack of brightness all too often makes HDR (which was designed for the brighter world of TV technology) look so unconvincing that it’s actually less enjoyable to watch than SDR. The Sony VW870ES’s impressive brightness is backed up by a strikingly rich colour palette. As well as being a feast for the eyes in themselves, the bold saturations stop the VW870ES’s brightness from making tones look thin or wan. There’s exceptional subtlety and precision in the VW870ES’s colour handling, too. This helps HDR pictures look three-dimensional and life-like, rather than forced and plasticky – even with skin tones. Early pre-release demonstrations of the Sony VW870ES raised concerns about its black level response. Happily, though, Sony’s engineers have greatly improved matters for the finished product. Dark parts of mostly bright pictures tend to look fairly rich and deep for a laser projector, despite the image’s punchiness in bright areas. There’s an impressive amount of shadow detail in dark scenes, too. This is all testament to the cleverness of the combined laser output/iris engine. Especially since the system achieves its results without much sign of flickering or obvious, distracting shifts in the picture’s underlying brightness. It’s a sign of how impressive the VW870ES’s HDR efforts are that I haven’t yet mentioned its phenomenal 4K resolution. The combination of native 4K SXRD image chips and the impressive new 4K-friendly lens ensures that 4K Blu-rays looks incredibly detailed, crisp, textured and sharp. Comfortably beyond anything the many “pseudo” 4K projectors out there can do, and even better than the VW570ES. The exceptional resolution holds up well during motion, too, if you choose the True Cinema motion processing option. The Sony VW870ES also performs well with SDR, HD content. The Reality Creation system does an excellent job of upscaling HD sources’ resolution, adding more detail without exaggerating noise. And the laser lighting just about restrains itself enough to keep SDR’s colour tones looking natural and nuanced. That said, if you’re expecting to mostly be running SDR content on your projector, the VW570ES will probably suit you better. While the VW870ES is capable of looking unprecedentedly (for its money) spectacular with HDR content, it isn’t perfect. In particular, while its black levels are better than expected for a laser lighting system, they’re nowhere near as profound as those of JVC’s lamp-based D-ILA projectors. Of course, those JVCs can’t get as bright as the VW870ES. But if black level is your main “go to” picture feature, the VW870ES is worth trying before you buy if possible. Fan noise can be a touch loud if you use one of the projector’s relatively high brightness settings (which you need to for HDR). The noise is smooth and consistent, though, making it easier to tune out. Arguably, the noise isn’t as bad as might have been expected from a laser projector delivering such punchy images. Otherwise, the only remaining issue is some slight colour banding in certain dark HDR tones. Why buy a Sony VPL-VW870ES? The Sony VW870ES does a more impressive, punchy, enjoyable job with bright HDR content than any projector we’ve tested to date. This combines with phenomenal 4K sharpness to deliver pictures from 4K Blu-rays that can look absolutely sensational. The only catch is that, as is usual with laser projectors, the brightness the VW870ES produces comes at the expense of some black level depth. Certainly, the VW870ES looks greyer in dark scenes than some rival projectors. Not nearly as much as I’d feared from early demonstrations, but enough to make its £25,000 price look a touch steep versus the mere £8000 you need for Sony’s VW570ES or the £8800 for JVC’s DLA-N7. The VW870ES delivers the most impressive 4K HDR pictures I’ve seen on a home cinema projector to date. If you have a dedicated home cinema room and enough spare cash to even be thinking about buying a Sony VW870ES, then there really isn’t another device like it on the market right now.